“Go big or go home” doesn’t have to apply when you’re already talking about your home. You don’t need to invest a ton of time or money to make a big statement in your backyard. Here are some things you can do in your yard that fit both the biggest and smallest budgets. 1. 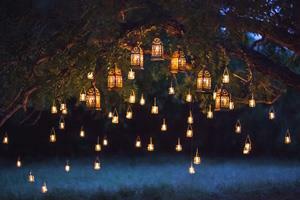 Hang some lights – It just takes a few lights to completely transform your backyard. If you buy them right after Christmas, you can get outdoor lights for 75-90% off. But even if you pay full price for non-seasonal outdoor lights, you can still find them for $10-20 a strand. 2. Add a swing or hammock – A porch swing or hammock doesn’t have to set your budget back a whole lot and having one adds a quiet retreat to your yard where you can kick back and enjoy the fresh air in comfort. 3. Grow a garden – Plants or flowers can add to the beauty of your yard and enhance your backyard experience. Plus, depending on what you plant, you could repel mosquitoes, attract butterflies, or cut down on your costs for fresh produce. 4. Add a firepit – This project can be as simple or as complex as you’d like, and once it’s ready, you’ll have the perfect place to gather your friends and family for good conversations and marshmallow roasting! 5. Buy a grill – Charcoal or gas doesn’t matter as much as the fun BBQs and delicious food that will result from adding a grill to your yard. 6. Create a water feature – You can pick up a pre-made fountain for a few hundred dollars or build a larger, custom-made pond to fit any budget. Whichever way you choose, your fountain can add to the peace and tranquility of your yard. 7. Fence it in – They say good fences make for good neighbors, so adding or upgrading your fence is a great way to enhance your space. A good fence can keep out prying eyes, protect kids and pets, mark your property line, and add visual appeal. 8. Add a deck or patio – While this project is a little pricier, a deck or patio will provide years of outdoor fun. Whether you lay bricks, pour concrete, or install a wood deck, adding a deck or patio can turn your backyard into a premium entertaining space. 9. Build a playground – A backyard playground is a great way to keep children entertained. Even something as simple as a sandbox will give your kids a safe and creative play space. Shop around to find something that fits your space and budget. 10. Get a pool – What’s better than having your own private pool? It can add hours of entertainment and is a great go-to party theme.